So it is Summer yesterday and today and then we are back to winter for the weekend. There have been a few sights of Spring in-between of which this is one. 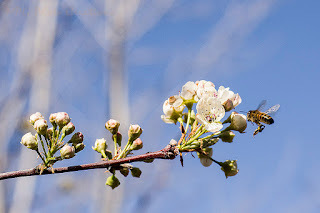 I have some Ornamental Pear trees on my land and they are actually blooming despite having temps last weekend of only 15 F degrees. I captured a Honey Bee that was enjoying the blooms while it could in this crazy weather.